9352 - This couple shares an intimate embrace before setting off in their petite row-boat made just for two. A sweet “Just Married” sign suspended on the back of their boat adds the perfect wedding touch. 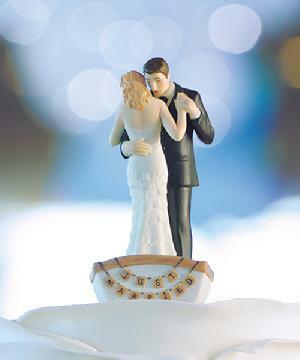 Whether outdoor enthusiasts or simple fans of true romance, here is a cake topper that will surely make you smile. Made of hand painted porcelain. 14cm tall.